Are fuel discount schemes really benefitting consumers? Z Energy says seven of every 10 fuel purchases use a supermarket discount voucher or loyalty card. It’s not the only one – you can also get cheaper petrol and diesel by flashing the right card at BP, Caltex and Mobil. But what are you giving up to save a few cents on a litre of fuel? We investigated the major discount schemes to find out. There are three major fuel companies in New Zealand – Z Energy (which also owns Caltex), Mobil and BP. They collectively own facilities for importing and refining crude oil, which produces the petrol and diesel they then distribute and sell. The fourth player is Gull. It doesn’t refine crude oil in New Zealand, but is the only other company with facilities to import, store and distribute petrol and diesel here. For companies in competition, the big three work very closely together. They’re shareholders in the Marsden Point refinery and have an agreement that gives them a certain proportion of its output. Refined petrol and diesel is piped to Auckland (Wiri) or shipped to port terminals around the country, where it is stored and then distributed to retailers. These fuel retailers are major shareholders in the pipe to Auckland, and jointly own the ships used for distribution and terminals for regional storage. 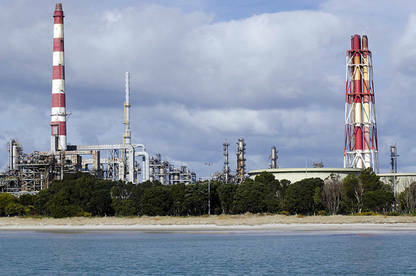 The Marsden Point refinery produces about 58% of New Zealand’s petrol (and 67% of diesel). The rest is shipped here as a refined product. The big three do that too – delivering refined fuel directly to their port terminals. This is where Gull gatecrashes the party. It has its own terminal in Mt Maunganui, where it ships in fuel to be distributed to its retail outlets by road. The collaboration doesn’t end there. The big three all have terminals for storing petrol and diesel, but not at all locations. So, they work under a “borrow and loan” scheme. This allows each company to draw down fuel from any terminal, as long as it tops it up again. Effectively, they share the same fuel once it gets to the terminals, and they all know how much fuel their competitors are using. The other fuel retailers you see by the roadside: Waitomo, Gasoline Alley Services (GAS), Challenge, NPD, and the Foodstuffs supermarkets New World and Pak’nSave sell fuel buy wholesale from one of the three major players. Gull only supply Gull outlets. The big three claim the retail fuel market is competitive, but many clued-up observers and wary consumers suspect it isn’t. New Zealand has one of the highest pre-tax petrol prices in the OECD (second-highest of 33 countries in 2017), and retail gross profit margins have been rising steadily from 10% in 2013 to 25% in 2017. The Commerce Commission is investigating. In October last year, the Commerce Commission got new powers to look into market competitiveness “if they are deemed to be in the public interest”. Previously, the commission was limited to investigating and regulating markets. Its first study investigates the “factors that affect competition for the supply of retail petrol and diesel for land transport”. In announcing the study, consumer affairs minister Kris Faafoi said, “it’s in the public interest to ensure people and businesses aren’t paying too much for fuel. 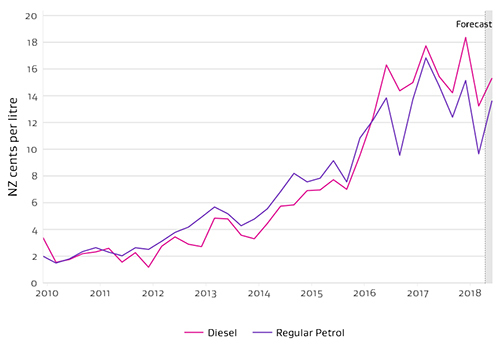 There are existing indications of competition problems in the retail fuel market that are of concern to me, such as the more-than-doubling of petrol and diesel importer margins over the last decade”. The final report will be released in December. You can find further information about the study at comcom.govt.nz. The main players in the fuel market offer discounts on petrol and diesel through loyalty schemes and retailer partnerships. Casual users get a modest discount from the advertised per-litre price, while those willing to adapt their fuelling and other shopping habits could do better. Saving a few cents per litre comes with drawbacks, though. Each scheme has different rules to follow and, in most cases, you’ll be giving up personal data and sharing a picture of your shopping habits. Gaspy: the easy way to compare prices? A 2018 report by MBIE showed retail fuel discounts rising from an average 2¢/L in 2012 to 10 to 14¢/L in 2018. Fuel retailers argue there’s no problem: discounts are available, so everyone can get cheaper fuel. We don’t agree. When discounting becomes the norm, it distorts price competition between retailers, making it harder to see who offers the cheapest fuel. As not everyone can use a fuel discount, or chooses to use one, they are an example of discriminatory pricing – where the same product is offered to different people at a different price. That’s unfair because some customers are subsidising others. It’s not just limited to petrol and diesel: grocery shoppers inadvertently pay for fuel discounts, even if they don’t own a car. Usually, the discounted price isn’t the cheapest – it’s an illusion of “getting discount” rather than getting the best price. Using Gaspy at 11am on 7 March, we found all retailers in Hastings that offer discounts (BP, Caltex, Mobil, New World, Pak’nSav and Z) had an identical price for regular 91 petrol, which was 13¢/L higher than the local Gull outlet. We think it’d be fairer for all consumers without fuel discounts and loyalty schemes. Pricing would be transparent and we could simply fill up as and when needed, at our choice of cheaper or more convenient service station, without jumping through hoops to eke out a few more cents of savings, while keeping our personal data personal. The only ‘losers’ would be the fuel companies. What’s not to like about that?